She smiled broadly and said “I’m just happy to be able to do this.” I could tell she meant it. For those of you who aren’t familiar with this chapter in our city’s history, let me enlighten you. Clara Luper was a history teacher at Dunjee High School in Spencer and the advisor of the OKC NAACP Youth Council. In August 1957, she and her students led a non violent sit in at Katz Drug Store in downtown OKC, the first such action in the nation. It only took 3 days to desegregate the nationwide Katz chain. Luper could have declared victory and stopped there, but instead she personally desegregated hundreds of restaurants, movie theaters, amusement parks and other public accommodations across the state. In Oklahoma at least, she was Jim Crow’s worst enemy. Oklahoma City in the 1950s was not the same sort of blood soaked battleground in the civil rights struggle that places like Birmingham, Alabama and Greensboro, South Carolina were, but that does not diminish the bravery of Luper and her students or the magnitude of their accomplishment. Clara Luper took on this struggle at a time when other people in the movement only a few states away were being murdered with impunity, when American citizens of African descent were routinely subject to humiliations and degradations that no human being should be forced to endure, let alone tolerate. Clara Luper was an uncommon woman, and she was many things in her long life- the first African American to earn an MS from the University of Oklahoma, an acclaimed author and playwright, a candidate for US Senate, a radio host, a frequent prisoner in southern jails, spokeswoman for striking sanitation workers, a beloved mother and grandmother, but most of all she was a teacher. 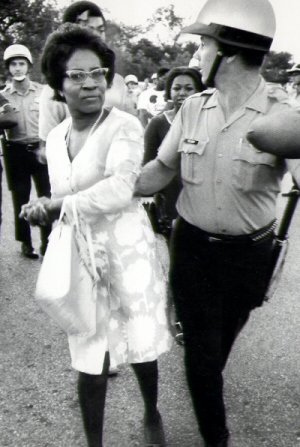 Clara Luper taught her students that human rights aren’t negotiable, and that direct action works. She taught our city that “custom” and “tradition” were flimsy walls to hide injustice behind, and that fear and intimidation are the weapons of cowards. The world Clara Luper fought to create is one in which the rights of any citizen cannot be swept aside by popular vote, where all people can live lives of dignity without fear. There is still much work to be done in our fair city to bring her world to life. Luper was in the mix until the end, always trying her best to make the world better for all the people who live here. It has always seemed strange to me that we wait until our heroes are gone to write nice things about them. I think the instinct is to not close an open book prematurely, but I hope that in life Clara Luper knew how many people loved her and respected her. She may be gone from this world, but she still has plenty to teach us. I hope we are ready to learn. Clara Luper’s memorial service will be held at the Cox Convention Center tomorrow at 10 am. Doors open at 9:30. Dress nice if you can. Tagged 30, African American, Clara Luper, Cox Convention Center, History Honors Society, Jim Crow, Katz Drug Store, MS, OKC, Oklahoma City, South Carolina, UCO. Bookmark the permalink.